The commanding figure of the Baptist stands in an uncommonly green and fertile ‘desert’. Wrapped in a supple camel skin of a beautiful golden brown reversing to red, he leans to the left, as if addressing an unseen multitude. John is flanked by two very different figures, neither of whom can be securely identified. Both have their eyes fixed on the Lamb, the symbol of Christ. The grave, bearded man on the left is tonsured and wears a monastic habit. He could represent a member of the Jewish priesthood who wants to hear what John has to say or he could be someone else entirely. 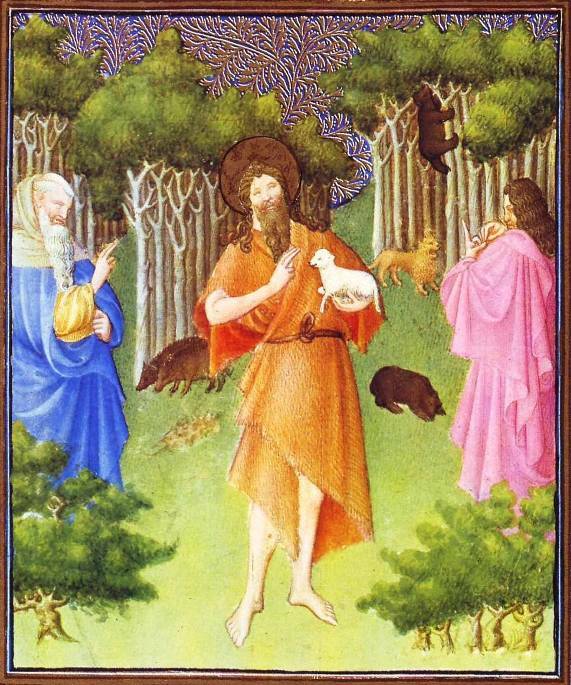 The bears, boars, and a lion in the background are simply meant to signal to the viewer that John is in an untamed wilderness. Bears were among the Duke of Berry’s favorite emblems.